[To prepare the sponge]: Line a baking tray (30x40cm) with baking parchment paper or non-stick silicone mat. Preheat the oven to 200ºC. In a mixing bowl, combine the sugar and egg yolks. Split the vanilla pod and scrape the seeds into the bowl, or add the essence. With the paddle attachment, mix on medium speed until the mixture is pale and creamy. Add the flour in batches, mixing well after each addition. In a clean mixing bowl, whip the egg whites with the balloon whisk attachment on high speed until they stiff. Using a spatula, gently fold the stiff egg whites into the batter. Pour the cake batter onto the prepared tray, spreading out in a thin layer (1/2cm). Bake for about 10 minutes, or until cooked. Remove from the oven and transfer the sponge-along with the parchment paper – to another tray. Wrap with cling wrap while hot and keep in the refrigerator. [To prepare the butter cream:] In a saucepan, combine the sugar and water, and cook until syrupy (121ºC). Place the egg yolks in a mixing bowl with the paddle attachment. Mixing on a low speed, pour the syrup in slowly; whisk until the mixture has cooled. Add butter and whisk on medium speed until creamy. Divide the cream into two equal parts. Stir he melted chocolate into one portion, and the coffee mixture into the other portion. [To roll the log:] Peel the baking parchment paper from the sponge. 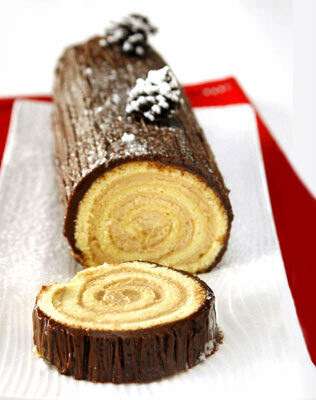 Using a spatula, spread the coffee cream on the sponge and roll into a log. Trim the ends neatly. Cover the log with the chocolate cream. Drag the tines of a fork lightly through the surface of the cream to make it look like tree bark. Decorate to your liking.